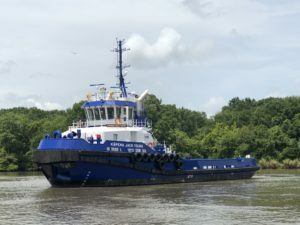 HONOLULU, July 2, 2018 – The Kāpena Jack Young, the first of four new ocean-going tugs that will soon begin neighbor island service for Young Brothers, has been christened in Louisiana. The Kāpena Jack Young, designed by Damen USA and built by Louisiana-based Conrad Shipyard, marks the arrival of the first new Kāpena class tugs built for Hawai‘i-based Young Brothers, an independent subsidiary of Foss Maritime. “Kāpena” means “captain” in the Hawaiian language, and the name for the class of ships celebrates the skill and innovation of Young Brothers’ Hawaiian navigators and will be home-ported in Kaunakakai, Moloka‘i. The new class of tugs are designed to match Young Brothers’ fleet of modern high capacity barges, and will improve the company’s ability to provide “just-in-time” cargo service to Neighbor Island communities, while enhancing service through lower maintenance down time, better tow speeds, greater operating efficiencies, and lower emissions. The Kāpena Jack Young is named after Captain Jack Young, one of three brothers who founded Young Brothers in 1900. Each of the four new Kāpena class tugs will be named after an original Young Brothers’ captain, including nā Kāpena George Panui Sr. and Jr., Bob Purdy, and Raymond Alapa‘i. The christening of the Kāpena Jack Young was held at Port Fourchon with representatives of Young Brothers, Foss Maritime, Conrad, and Damen in attendance, as well as Sharon Young, Jack Young’s granddaughter, who sponsored the vessel. The 6,000 horsepower, 123 foot by 36.5’ vessel is powered by General Electric 8L250MDC—state-of-the-art EPA Tier IV emissions compliant exhaust gas re-circulation engines.